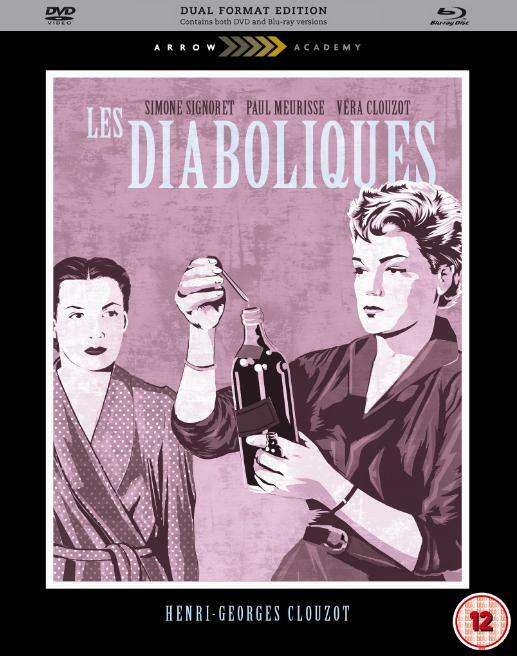 Arrow Academy bring us another classic of international cinema this month with their release of a high-definition transfer of Henri-Georges Clouzot's stunning thriller, Les Diaboliques (1955) in a dual-format Blu-ray/DVD edition. Regarded as a masterpiece of suspence, the film developed from Pierre Boileau and Thomas Narcejac's 1952 novel Celle qui n'était plus (She Who Was No More), a thriller spotted by his wife Véra Clouzot as a potential source for adaptation on the back of his international success with Wages of Fear (Le Salaire de la peur) in 1953. As Susan Hayward expands further in her superb book on the film, Véra then persuaded Clouzot to grab the rights and, having succeeded, he hung on to them for a year, thus blocking Alfred Hitchcock from getting access to the story. Hitchock would eventually secure the rights to Boileau-Narcejac's third novel, D'entre les morts and turned this into his own masterpiece, Vertigo in 1958. 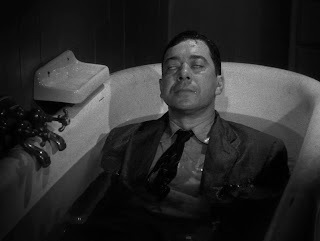 In many ways, Les Diaboliques went on to influence Hitchcock's landmark Psycho (1960) with similarities in plotting, especially the murder, how the murder victim's body is disposed of, the inclusion of a private detective Fichet (also allegedly inspiring Columbo's creators according to Roger Ebert), and the celebrated twist towards the end of the film. "he completely inverted the sexual dynamics and heterosexualised the original text"
Not only that but Hitchcock borrowed Clouzot's end title card gimmick, a 'don't be diabolical' warning to the audience not to give the twist away, for his Psycho marketing campaign and similarly advised cinema managers to follow Clouzot's no late audience admissions policy. Psycho writer Robert Bloch also professed his admiration for Clouzot's film and it has been intimated that the infamous shower scene is a riff on the terrifying bathroom sequences in Les Diaboliques. Both films could be regarded as exercises in very sophisticated and rather shameless showmanship by the way they manipulate the audience's expectations. But I digress. According to Hayward, Clouzot apparently found adapting the novel somewhat difficult, as he felt obliged to give his wife a central role in the film, and it took him 18 months and a collaboration with his co-scriptwriter (and brother) Jérôme Géronimi to fashion the bizarre love triangle in the setting of a down at heel boy's boarding school that would provide Véra with a strong, pivotal role in the psychodrama. In doing so he also changed the dynamic of the original book, much to the irritation of Boileau and Narcejac. To furnish his wife with a bigger role, Hayward explains, "he completely inverted the sexual dynamics and heterosexualised the original text." In the Boileau-Narcejac book, it is the two female characters Lucienne and Mireille who are lovers and they attempt to murder Mireille's husband. In the film, it is finally revealed that the husband and his mistress plotted to kill the wife. After casting Véra in the role of the frail Christina, a woman with a weak heart and the wife of a tyrannical headmaster Michel Delassalle (Paul Meurisse), Clouzot cast Simone Signoret as Nicole Honer, a teacher at the school who is having an affair with Delassalle. It was allegedly a tortuous shoot and the working relationship between Clouzot, his wife and Signoret became increasingly tense and bitter and by the end of filming they were barely on speaking terms. 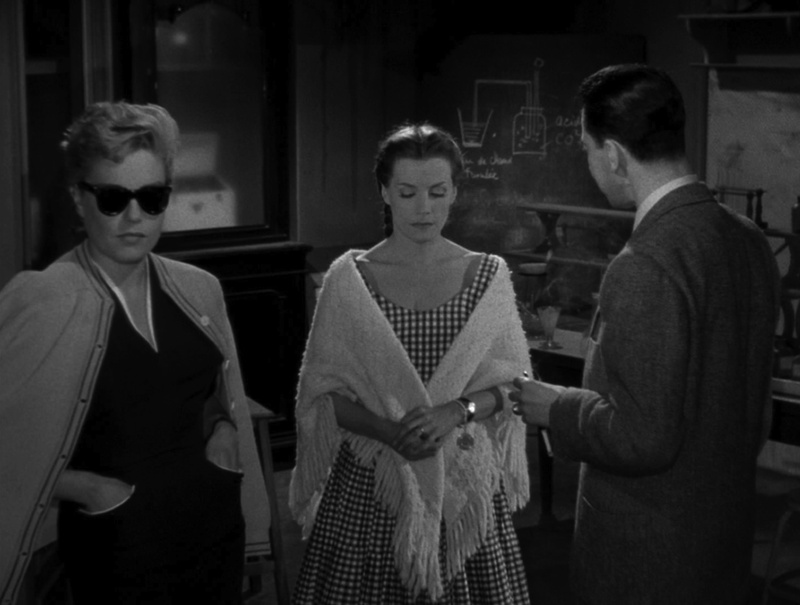 Much of this may well have been because of the inordinate amount of attention Clouzot paid to how his wife was photographed in the film in an attempt to prove what an expressive actress she was and to demonstrate, one presumes, her star quality. 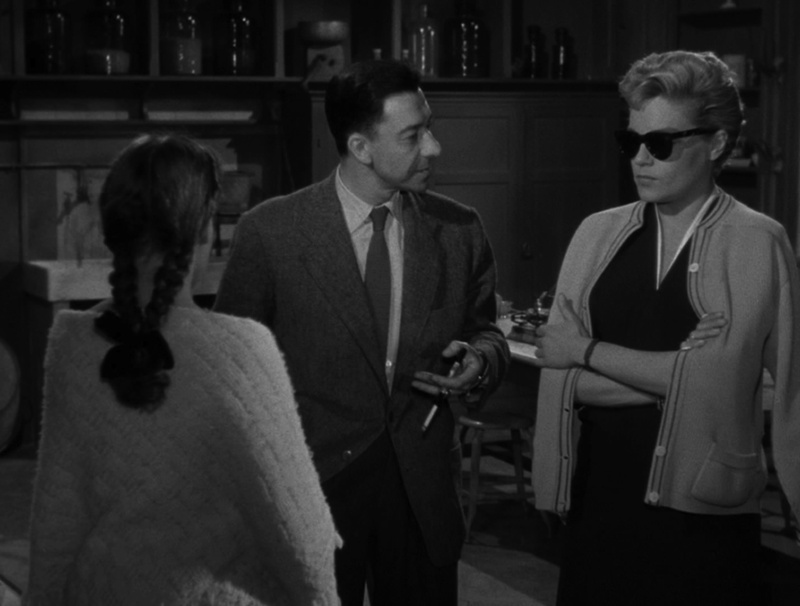 Certainly, it is very noticeable how Vera's face is nearly always fully lit, positively glowing with light throughout the film, while Signoret is often bathed in shadow. 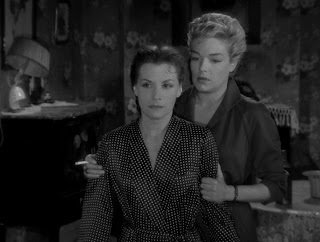 However, as has been noted, before the film's final revelation, the lesbian theme is still an undercurrent in the drama as the two women Christina and Nicole (with Signoret already reknowned for her femme fatale role in 1952's Casque D'or and who would in 1959 play Joe Lampton's mistress, Alice, in Jack Clayton's Room at the Top) grow closer as they unite in their loathing for this abusive man. Their plan to hide away for a weekend as they carry out their transgressions also suggests a conflation of the social, sexual and criminal aspects of their relationship and it's interesting to see that the Christina and Nicole criminal alliance reverses the traditional roles in classic noir where it is usually a male antagonist at the centre of such plots. As Susan Hayward notes on the excellent audio commentary, they also conform somewhat to the butch/femme lesbian stereotypes - Christina rather girly and fragile in her pigtails, angelically white shawls, dresses and nightgowns and Nicole coolly demonstrative in dark, sharp suits, cropped hair and defined poses. The contrast between them is also manifested in the decor of their rooms. Christina's bedroom at the boarding school is a dark, Gothic space, a confessional box stuffed with religious iconography but Nicole's house, which she rents to tenants, is a clash of styles and objects, dominated by a table covered with a temporary nylon cloth and a mantelpiece displaying a huge bronze lion both of which will find an alternative use in Michel's murder later. 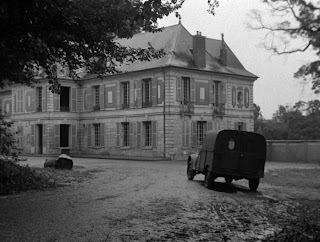 Using the school's half-term holiday as their cover, they lure Michel to Nicole's house in Niort where Nicole encourages Christina to demand a divorce, using this as a pretext to knock him out with a bottle of drugged whisky and drown him in a bath. They then drive back to the school with the body (his soaked corpse leaking onto the floor of the van) and dump it into the dirty, algae-covered water of the school's swimming pool. However, when concern is raised about the missing Michel and Christina works herself into a frenzy worrying about the discovery of the body, Nicole agrees to drain the pool. However, the body has vanished. Sightings of the headmaster are reported at the school. Then a body is recovered from the Seine and believing it to be Michel, Christina goes to the morgue to identify it. When she fails to recognise the corpse, her anxious state comes to the attention of a retired detective, Fichet. Clouzot signals early on how oppressive and cruel this film experience will be. After the doom laden, booming organ of the opening titles, the headmaster arrives at the school on a dreary, wet day. His cruel nature is symbolised as he drives his van through a puddle on which is floating a simple paper boat, presumably made by one of the boarders at the school. 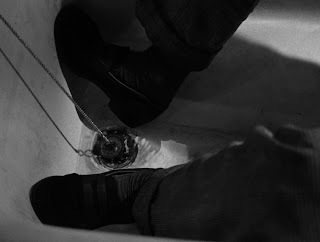 This also is the first in a succession of images connected to water and drowning as part of the film's dank, clammy atmosphere. That foetid quality is inextricably bound up with Christina's ill health and frailty and her increasing anxiety once she and Nicole discover that Michel's corpse is missing. Fearing Michel has literally become the walking dead, she is reduced to an emotional wreck, her forehead gleaming with sweat in the film's tense conclusion. The sense of decay that Clouzot introduces into the film, beginning with Christina throwing stones in the stagnant water of the swimming pool, is not only heightened by the body kept in a wicker basket on the back of a van and then dumped in the pool (Clouzot blatantly shows Michel's bloated face on several occasions) but also by Michel's cruel and parsimonious regard to feeding the teachers and boarders at the school where, at the beginning of the film, they are served up fish and sauce that is well past its sell by date. The later visit to the morgue by Christina is equally unsavoury as Clouzot realistically details the removal and display of the drowned body recovered from the Seine brought out from the bowels of the morgue in order for her to view it. 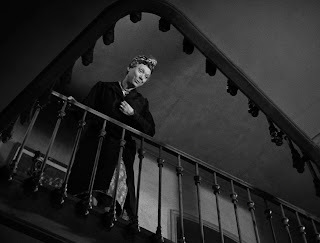 Throughout the film, characters are seen looking into and out of interior spaces, often observing the activity of other characters and drawing conclusions about them that is eventually something of a contradiction, a view that is not truthful. Clouzot plays with our own observation and the meanings we gain by seeing things that are not necessarily true, deflecting us from the truth right until the end of the film. It happens with the pupils and teachers in the school, with Nicole's tenants in Niort when she and Christina arrive to plot Michel's demise and, very importantly, with the introduction of Fichet, who rather like Lieutenant Columbo, constantly emerges from the shadows having witnessed some vital part of the narrative. The major iteration of this is the relationship between Michel, Nicole and Christina. Clouzot provides the audience with a set-up that they believe in for at least two thirds of the film and then he shatters that belief with the twist ending. 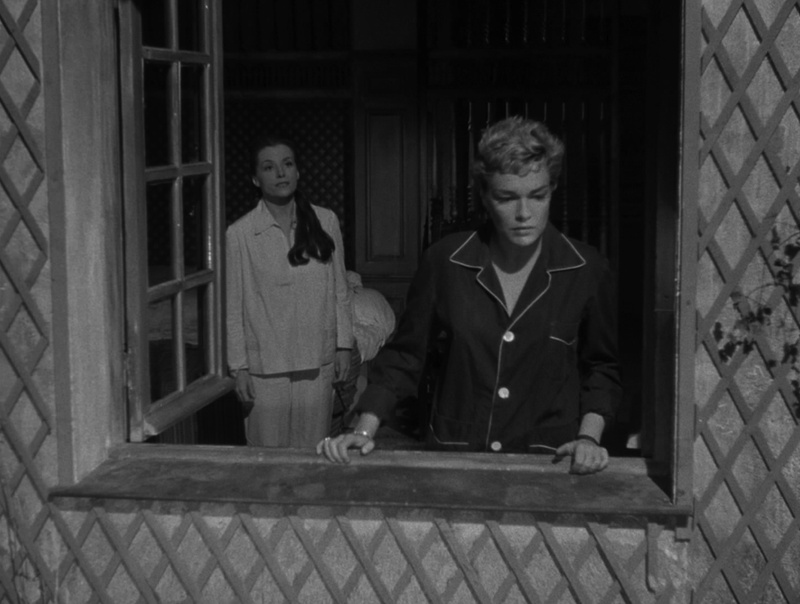 Hayward sees the film's theme of 'snooping' as Clouzot's own commentary on the post-war and post-occupation, repressed state of French society. 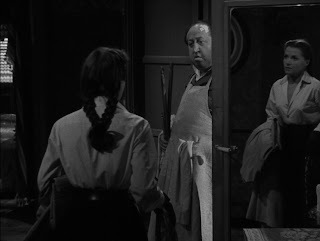 The film is a mesh of substance and shadow, of emptiness and presence, with the characters reflections often caught in mirrors to emphasise the nature of true and untrue appearances in the film. This ghosting is particularly highlighted when Michel's corpse vanishes and his appearance is reported by one of the schoolboys or his image is seen in the background of a freshly developed school photograph. The life given to inanimate things (the basket, the brass lion, the typewriter) and especially to a missing corpse is very Hitchcockian in flavour. Also note the shots Clouzot uses in the house in Niort as Nicole and Christina arrive and drag the key object of the film, the wicker basket, up the stairs. Shooting through the staircase, Clouzot pre-empts the visuals of the stairs and halls that would represent the Bates house in Psycho. Later, the bathroom and the drowning of Michel is virtually a dry-run for the famous shower sequence and a shot of the bath emptying down a plughole even suggests that iconic moment where Hitchcock used a close up of the shower water and blood swirling similarly away in the murder of Marion Crane. 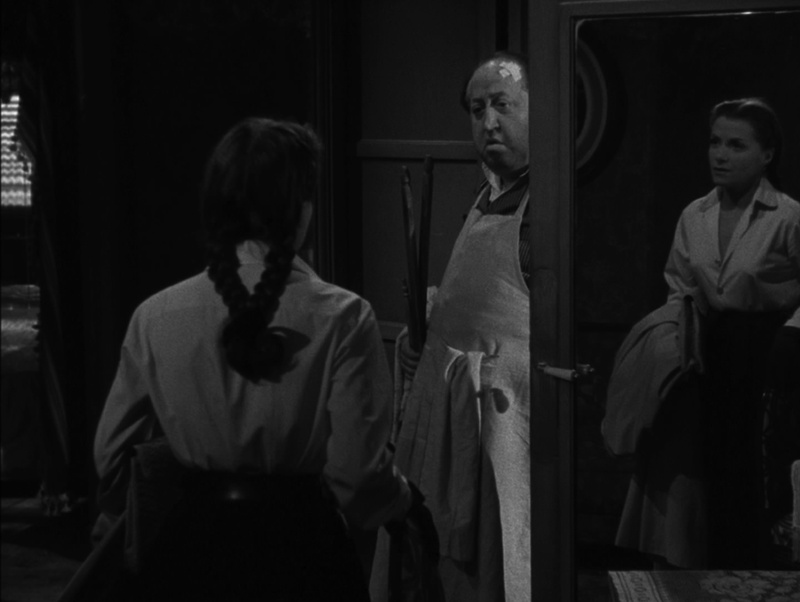 There's also a very strange moment when Christina follows a trail from the dry cleaner's delivery of her dead husband's suit to a hotel room where she encounters a concierge who uncannily resembles Hitchcock as he appears from behind an opening door in her husband's room. Just before the murder in Nicole's house in Niort, Clouzot introduces the radio quiz-loving upstairs neighbours, the Herbouts, and intercuts them, using much humour, with the murder scene. 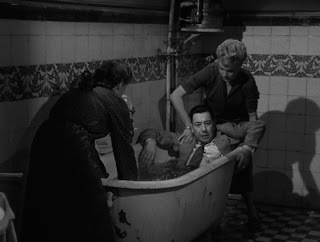 Here, Monsieur Herbout complains he's unable to hear the radio above the noisy plumbing, while his wife is busy plucking hairs from her chin, as he presumes Nicole is taking a bath late at night when in reality she's helping Christina drown her husband. Later, there's also the comedy of the drunken conscript who attempts to hitch a lift in the back of the van, complete with body in a basket, his presence threatening to reveal the crime. The antics of the schoolboys and their relationship to their teachers at the boarding school also provides some necessary light relief in the tense and gloomy narrative. The climax of the film is a superb exercise in pure cinema and the creation of suspense as Christina, bedridden since collapsing at the side of the empty swimming pool, having witnessed the return of Michel's suit from the drycleaners, visited the morgue and worked herself into a paranoid frenzy about his return from the dead, goes to investigate suspicious noises in the dead of night at the school. 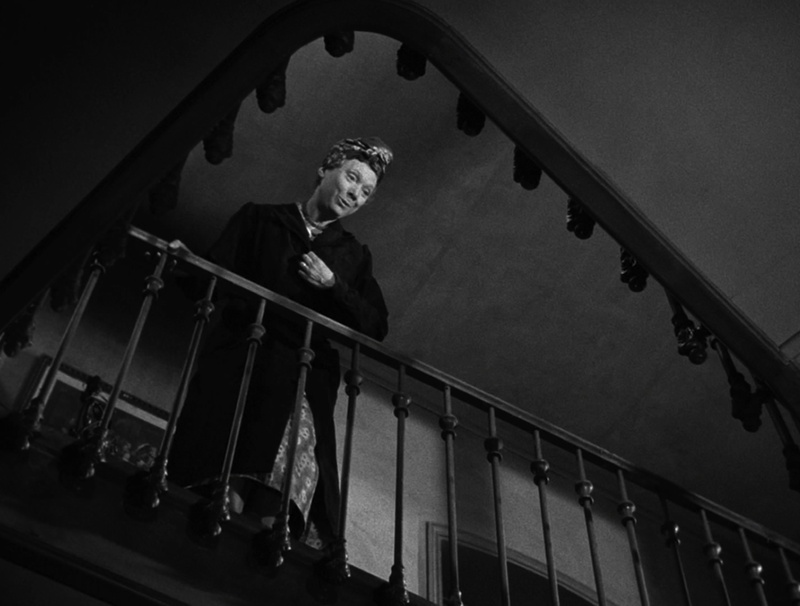 Expert use of sound and Expressionist imagery pile on the terror as she hears the creaking of doors and someone using Michel's typewriter while she sweatily and breathlessly explores the corridors. 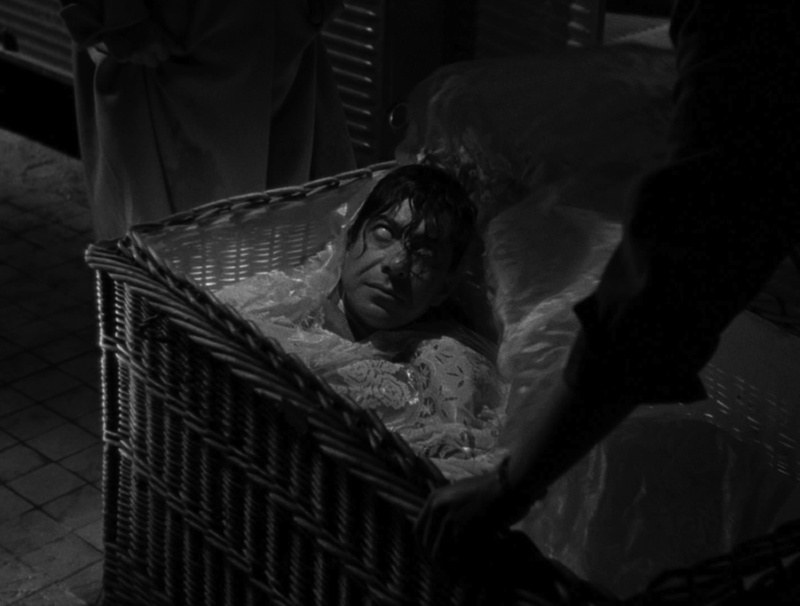 Her final collapse occurs in the celebrated sequence where she sees Michel's corpse, blank eyed, rise out of the bath. It's also at this point when the film completely turns on its head and all the supernatural elements are are revealed as bogus. Performances from all three of the main cast are excellent and despite the suggestion that it was a bit of a vanity project for Clouzot's wife, Véra is very convincing as the fragile Christina. Signoret and Meurisse have their work cut out for them because their entire performances are about pretence, acting out the murder in order to kill Véra without giving away their intentions to her or the audience until the last scenes. As Hayward points out in the commentary, there are clues in their performances that hint at the truth of their relationship before it is revealed. Both are superb handling the fantasy and reality of the triangular relationship in the film. Now, onto the technical quality. Considering this is a new restoration of the original negative, I found this high-definition transfer a tad disappointing. The wonderful depth that Bicycle Thieves presented is lacking here and only occasionally does the picture offer instances of the crisp detail that you would expect to find. The image is soft and grainy, with the visuals often appearing dream-like, and this may well be how Armand Thirard, the film's cinematographer, and director Clouzot wanted Les Diaboliques to look so it's difficult to be certain if this is entirely true to their vision. The contrast and brightness are very good and the transfer is clean, perfectly complimenting Thirard's moody black and white imagery and Léon Barsacq's Gothic tinged art direction. This is definitely the best I've ever seen the film look even though the presentation in high-definition is much subtler here than with other black and white material of a similar age. Audio commentary by Susan Hayward, author of Les diaboliques (Cine-file French Film Guides), Hayward's commentary is very good, is insightful and re-presents much of the analysis from her superb book. I particularly liked her discussion about how Clouzot framed certain shots with the three main characters. The only downside to this is that, while it starts out in full flow, after about 40 minutes in her comments become quite sporadic and there are some long stretches of silence. I'm sure there are plenty of observations to fill 110 minutes but Hayward's track is often very scene specific and perhaps more general background information could have been presented to fill in the gaps. Comprehensive booklet featuring brand new writing on the film by author and critic Brad Stevens and a re-printed interview with Clouzot by Paul Schrader illustrated with stills and rare original set drawings by Léon Barsacq. Artwork presentation packaging including original posters and a newly commissioned artwork cover.